All animals are amazing. But some are EXTRA-amazing! So come and meet them in this Guinness guide, introduced by celebrity pooch Jiffpom. (His record: the most-followed dog on Instagram.) As Jiffpom puts it, human record-breakers are cool, but everyone knows that four legs are better than two! 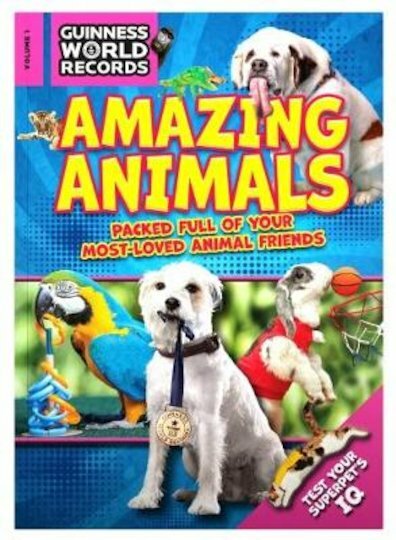 In this book you’ll meet peculiar pets, wacky wildlife and loads of adorably cute critters shown in amazing colour photos. There are surfing pigs, talking gorillas and even the world’s largest elephant orchestra! Plus, ever see a dog who thinks he’s Picasso or a bunny who plays basketball? You will now!